I made a couple pies over the 4th of July weekend. While I hate to seem immodest, I have to tell you… I'm still blown away at how amazing the pie crust came out. I've been making pie crust for decades and, thanks to Jeffrey Steingarten and Marion Cunningham, I have mastered a perfectly light, flaky pie crust. But this crust was even better than my best pie crust. A hundred times better! My pie crust was elevated from perfect to divine, thanks to a new ingredient. New to me, anyway. First, a little history. I've been using Marion Cunningham's recipe (translated by Jeffrey Steingarten in his book The Man Who Ate Everything) for years. It calls for about 1/2 butter and 1/2 lard (10 oz butter and 8 oz lard, to be exact). Lard is the fat from a pig, rendered into a creamy white butter-like substance. Most pastry chefs agree that the best kind of lard is leaf lard. It comes from the fat near the kidneys of the animal. I have used leaf lard and I have used regular lard from pigs. Both are very good. I suppose it's true that the leaf lard is superior. It's not a huge difference, but I think it is marginally better. I have also used leaf lard from cows (beef tallow, rendered from the fat near the cow's kidneys). That was also good, but not noticeably better than the pig's leaf lard. This weekend I experimented with a new ingredient. Something I had never used in my pie crust before. And it surpassed my wildest expectations. I try to be humble and don't like to toot my own horn. However, as I was eating this pie crust, I couldn't help but wax on about how unbelievably delicious it was, how delightfully flaky and airy — truly the most sublime pie crust I had ever eaten. The secret to the lightest and flakiest pie crust you'll ever eat: bison leaf lard. In other words, bison tallow from the fat near the kidneys. You're probably thinking, how could bison tallow be that much better than lard? I don't know why, but it was. It was exponentially better than all the other kinds of lard I've ever used. Beef tallow is harder and firmer than pig's lard. It becomes completely solid when left out on the counter, whereas lard stays soft. And bison tallow seems to be even harder than beef tallow. It's has the consistency of candle wax. It is precisely the waxiness of the bison tallow that is responsible for the airiness of the resulting pie crust. It's the hard chunks of fat that create air pockets which produces the flakiness in a pie crust. Wait a minute… does this mean we can prevent cavities by eating pie? Why, yes! Yes, we can. And isn't that a good thing to know? How lucky is my daughter? She'll grow up eating homemade pie with ice cream and real whipped cream — instead of being forced to eat raw carrot sticks and cooked spinach. The hardness of the tallow poses a bit of a challenge when you're rolling out the pie dough. It's easy to make holes in the dough so you have to be very careful. Otherwise the recipe is the same as my pie crust recipe posted here. Just use bison tallow instead of regular lard (make sure it's “leaf lard” — the fat from around the kidneys). I hope you can get your hands on some bison tallow and try this out. Oh, and I'll be posting my recipe for rendering tallow and lard very soon. Check back! If you haven't made a pie lately, do it! Your family will thank you. If you've never made a pie from scratch, try it! It really is so much easier than people think. And it's worth every bite. All this talk of pie is making me hungry. I think I'll warm some of the leftover pie for lunch (Yes, LUNCH! This is healthy pie! ), along with a slice of cheddar, some vanilla ice cream and a cup of decaf coffee. Ah, ain't life grand? This post is a part of Real Food Wednesday. Go check out Real Food Wednesday at Kelly the Kitchen Kop and share your real food tips and recipes. Thanks for enlightening us about an intriguing ingredient. You know, it is great to have a recipe that you are famous for! LOOKS SO GOOD! Is beef tallow as good for you as bison tallow? Also, about grass fed butter – I think you use Kerrygold – it isn’t organic, right? THANKS! Wow that’s fascinating! I use leaf lard regularly, rendering it at home, but it is always pig lard. We do have some buffalo suppliers at my local market and I may have to ask them if they ever have any lard to spare. I also have yak locally, and it would be interesting to try that as well…I will certainly update you on any experiments! Real Food Mama’s last blog post..Local or Organic – a follow up. Just signing on to leave a meaningless comment, so that I can get subscribed for future comments and hear all the latest happenings on such a fun post! I’m wondering if we can order bison leaf lard from Ken & Kathy? 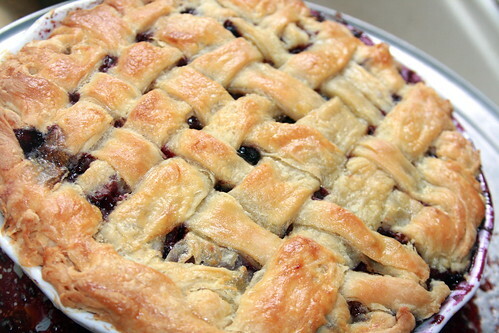 I’m stocking up on blueberries next weekend and will use your crust to make a divine blueberry pie!! I’m not much when it comes to baking, but that may change if I keep hanging around here. WOW! I got the bison tallow from Lindner Bison. They don’t have an online shopping cart or anything but if you can call their 800 # and order. If you are in the LA area, they sell their bison at many of our farmer’s markets. If not, call them and they’ll ship it to you. Tell them Cheeseslave sent you! Real Food Mama – Please keep me updated on the yak tallow — I’m curious! Where are you that you get yak locally? What a fantastic post! I am definitely going to make the effort to get bison leaf lard! Cheeseslave your blog is awesome! I love the part about how lucky your daughter is. Some people seem to think that I am depriving my daughter because she doesn’t get to have candy, chips or Cheerios. They don’t take the time to see how delicious and decadent our diet can be without those things. makes it super flakey for folding into the flour — we do this for our biscuits & other “pastry chefs” have done this. They absolutely rave about the difference! I don’t know if Kerrygold is organic. It is grass-fed butter, though, which is more important in my mind. And it is recommended by the Weston A. Price Foundation in their shopping guide. What do you think of the fact that it’s pasteurized? Does anyone really miss Pringles when they can have French fries made with beef tallow — or Cheerios, when you they can have Eggs Benedict with homemade Hollandaise sauce and bacon? And doesn’t it feel wonderful to know that these foods are GOOD for us?! So now I know why my grandmother’s pie was so much better…although I doubt she used the bison variety;-) I am calling the Lindner folks today. My plums and peaches await their chariot! I have never made a pie crust. Yours looks fabulous! I think I could find some bison tallow sort of nearby… I will look! I am looking forward to your post on rendering lard! I have some pork fat in my freezer that I have no idea what to do with. Hi – I am ordering today…can’t wait to try my first pie, though I will be freezing them for now as we are not nearly ready for pie in this house. Matt, my son with the autism diagnosis is ROCKING on the GAPS protocol. We are so excited. He is eating approx 6oz of grass fed beef liver a daynow, spread out for three meals and always blended into the soup that we call medicine and give before each meal. Ingredients: bone broth with bone marrow, onions, garlic, zuccini, beet, 1 raw egg yolk, and raw saurkraut juice and whey blended in…he takes three syringes of this prior to his chicken pancakes, grassfed hotdogs, or bison burger patties. The pernicious anemia seems to be melting away. We have had to drop ALL vits and supps except for the fermented CLO as it is all just too strong for him now that he is getting this dense nutrition. We are on day 15 of the probiotic enema portion of the protocol and Matt is now willing to sit on a potty, his eye contact is improving , his speech is improving, he PLAYED with his sister today – really played WITH her for the first time since the MMR. Unbelievable. He is up to several tbl of whey with no allergic response, and we are so hopeful about the eventual inclusion of ghee and yogurts…perhaps even COW dairy yogurt eventually. He will even sip a bit of green kombucha. THANK YOU SO MUCH for pointing us in the GAPS direction. IT is changing our lives and is SO SO much more appropriate for autism than the SCD or BED….I will let you know how we fare…and by the way, the 2 oz feeding syringes that one gets at medical supply places are the PERFECT means by which to drizzle and drop by drop your Olive Oil into a vitamix or blender for homemade mayo – perfect consistency with no hassle. a little chicken fat or other grease around the rubber tip makes them slide smoothly if they stick on you after many uses….take care. Diane mum to Matt, Terra Beth, Emma Cristina, and Catherine Joy…due in August – our first unvaccinated totally GAPS baby! Yes I used white flour. Unbleached, all-purpose. Sally Fallon has a pie crust recipe in Nourishing Traditions using white flour. She calls it a “compromise food”. White flour doesn’t have a lot of phytic acid because it’s refined so you don’t have to worry about that. It’s just not nutritious like sprouted whole wheat flour. So I don’t have a big problem with white flour as long as it’s (a) eaten in moderation and (b) used as a carrier for healthy oils like lard/tallow/butter/coconut oil. I am going to try my next crust using sprouted flour. So I don’t have to soak my white flour before baking bread. GOod to know. According to Ramial Nagel in his book Cure Tooth Decay, he says that it’s still best to sour or ferment your white bread (as in sourdough). According to Ramiel Nagel in his book Cure Tooth Decay, he says that it’s still best to sour or ferment your white bread (as in sourdough). This fantastic post is making me drool. Now I just need to figure out how to get some fine, fine tallow. Thanks again, for more healthy, and yummy recipes…do you have any idea how to make your own tallow?…for instance if I make Pork sausage, is what is left in the pan the lard? I always hate to throw that out, but I never know what to do with it. Great post! I like your site and the info about bad fats that turn out to be good. But I have to say, I *like* cooked spinach, and so do my 16-month-old daughters. And I bet they’ll like carrot sticks, too. I say, pie and ice cream *and* cooked spinach and carrot sticks! You’re right. I think cooked spinach is good, too. I prefer to eat my veggies with good fats. Spinach is delicious in quiche or spanakopita (made into a pie with eggs, cheese and butter). I also like spinach cooked in bacon fat — or a warm spinach salad with bacon. Carrot sticks are good sometimes, too, but they’re best dipped in homemade buttermilk ranch or blue cheese dressing. I’m not saying veggies aren’t good or important — I just think they are less important than the fats. did you gain weight when you started eating good fats? or stay the same? Okay, so the obvious question is, where on EARTH does one find Bison tallow? LOL!! I am dying to try this. I love pie and I use the regular ol’ betty crocker pie crust recipe with Crisco. I’m intrigued about a form of lard that is healthful??? Scroll up — I listed my source above in the comments. Lindner Bison run by Ken & Kathy Lindner (email/phone # above). I used Crisco for years but have since learned that it is NOT healthy. It’s full of trans fats which cause heart disease and cancer. Tallow and lard are healthy fats that have been used by traditional peoples for millennia. Crisco was only invented a century ago — by Proctor & Gamble as a way to use up industrial waste (cottonseed oil) from their factories. That is so gross how the manufacturers could care less about anyone’s health….. use up the leftovers and call it “food” Yuk! Interesting perspective on the white/unbleached flour. I’ll have to ponder that… cuz it is making a whole lot of sense. Lard is pure white and it looks like Crisco (they formulated Crisco to look like lard). Tallow is more of a cream color. These fats are rendered, meaning you cook them down until they are clear liquid. They turn solid at room temp. Bacon/pork fat in the pan tastes smokier than lard or tallow, which have a milder taste. Oh, and I’ll be posting my recipe for how to render lard and tallow any day now. Tallow is a new word for me. You say you got this from a local bison rancher/producer? What about other forms of tallow? I really have no clue. Also: I just posted about calcium and strong bones and tried to make an unbiased argument for and against milk. But it seems to be leaning against milk, especially in some of the comments. I’d love if you’d stop by and even the score! Thanks! Michelle @ Find Your Balance’s last blog post..Pasta for strong bones, say what? Scroll up for the website/email/phone # of the rancher. They will ship. Me, argue FOR milk? I’ll be right over. Is there a way to email you? I have a comment, but it might be better to send to you privately first. that’s a wonderful way to get vitamins. I like ice cream, although I can’t over do it like I would like to. Come to think of it, I freeze most of my butter so the same question would be for butter as well. Q: Is it okay to freeze raw milk and butter? A: It is fine to freeze raw milk and butter. There is no harm to the enzymes in milk nor to the fat-soluble vitamins in butter. Dr. Price actually tested frozen butter after a year and found no degredation. I think I read somewhere else (maybe it was in Sally Fallon’s lecture) that Dr. Price found something like a 4% loss in vitamins in the frozen butter after one year. So, anyway, whether the loss is zero or 4%, it’s negligible. I freeze all my butter, milk and cream. If you forget to give the cod liver oil, you can just give them a whole teaspoon every few days instead of 1/4 teaspoon every day. Possibly you could try Elk lard. That would be even more saturated than bison. Grass fed/hay fed Elk fat has almost no flavour. I live in Southern Ontario. There are a few farms where elk are raised. Probably if you live in southern California, your sources for elk would be further north. I think, if you are experimenting, it’s worth trying. Love this! Will try. Enjoy your blog, for I am a cheese lover! To your knowledge is there any online course that teaches this type of nutrition? From what I’ve read on your site it seems like you’ve learned what you have by reading vaious books and doing your own research. Which by the way I’m glad you did…thank you for all this great info! Are you looking to learn how to cook or to learn about nutrition? Well, I’m wanting to learn about nutrition but since this is completely different from anything else out there I’d also like to learn how to cook in this way (I do know how to cook). I do have the book Nourishing Traditions and am planning on using it as my daughters Nutrition text next year. I haven’t read the whole book yet but have leafed through it. I know there are some online nutrition classes you can take. Kind of like distance learning, where you actually get a degree. Hawthorn University is supposed to be good. They are always at the WAPF conferences so I know they teach about this stuff. I really think the Fleetwood mp3s are an awesome way to go because you can learn while you’re doing other things. I like to listen to them on my iPhone while I’m going for walks, driving, cooking or doing stuff around the house. And you learn everything you would learn in a school. They even give course credits when you go to the conference! I love your pie crust, but every time I make it, so much fat drips out of the crust and all over my oven — just from the top edge of the crust. Am I doing something wrong? m-m-m-m-m, I love chocolate. What a great idea. Speaking of chocolate, I think I”ll have some w/ tea. interesting…. I wonder what makes the bison tallow better for pie. I made a pie crust with lard for my sister and she was so disgusted when she found out. I think she may have even spit it out! I was surprised when I read that the traditional favorite for making pastries was bear grease! I have been tempted to go “shopping” in the woods and see. Certainly no shortage of them up here. Also comes with a large supply of sausage! love this info.will try same. like to bake very light , flaky crust pies-savoury/sweet. Thanks so much for the write up and your recipe. As for where to get buffalo leaf tallow… I’ve been making it for several years on our buffalo ranch and selling tubs of about 24 oz or 3 cups (volume) it is just as you described and Iove it. I also make soap and a wonderful healing skin cream and leather conditioner with it! I forgot to say that I am selling on line and at our farmer’s market and shipping it where ever you are. What a great entry on the virtues of bison lard – I have just purchased highest rated containers of both leaf lard and leaf tallow for making crust and also mincemeat pie filling for a relative who requests it each Christmas, but now I must get some bison lard and do a comparison. I’m sure I’ll be amazed, and amaze my friends and family as well. Can’t wait.